Invitations are not only pieces of paper that request people to attend an event—they are also great marketing tools that can boost the visibility and eventually the income of any business. Invitations become an effective marketing strategy tool when they have detailed and attractive designs. Invitations are not only used for business purposes since they are also used for other formal and casual activities like weddings, family reunions, sports activities, and the like. A well-crafted invitation is essential for any business if it holds events for colleagues, clients, and stakeholders outside the company, restaurants included. There are no limitations on the designs which can be used for restaurant invitation templates. The entire food library alone can be used as designs for the invitation, starting from using images related to simple condiments and seasonings like garlic, onions, ketchup, and mustard to using images or photos of heavy entrees like steaks and grilled food. Here are some attractive restaurant invitations to choose from if you are holding a party or event at your restaurant. 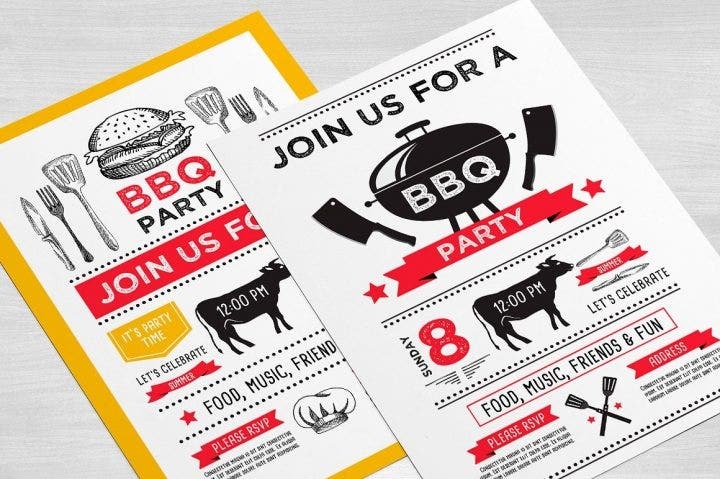 This barbecue invitation template is the best template for your grilled restaurant. Grilled food—whether it is pork, beef, chicken, fish, seafood, or vegetables—are probably the most delicious dishes on this planet and most people would not mind eating it every day. This BBQ invitation template uses some nice pencil-sketched images of barbecued food together with grilling tools and equipment. Occasions like Thanksgiving, Christmas, and Easter provide a great opportunity for your restaurants to host some events and promotions. Thanksgiving is the holiday where the magnificent smoked or baked turkey is served. Thanksgiving is also celebrated during the autumn season in November. Autumn is one of the best seasons in terms of climate due to the mild and cool weather paired with leaves of trees turning to red, orange, and yellow colors. This template uses autumn leaves as its main design element paired with a dark brown background. 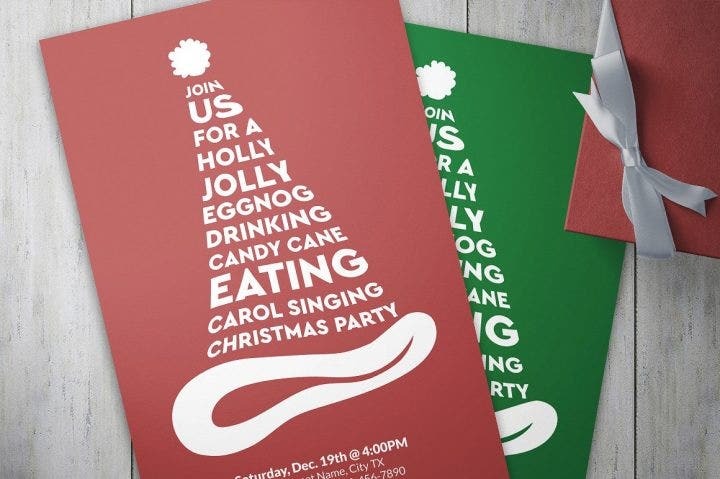 This Christmas invitation template is one of the best-looking designs to use this coming Christmas season which is only about a month and a half away. 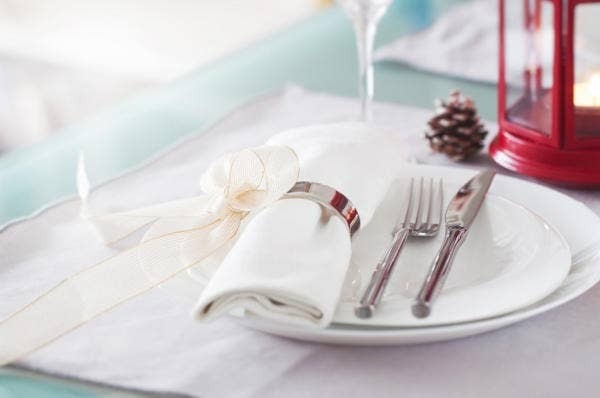 Use this template if you want to have a holiday buffet in your restaurant. The text is written in a form of a Santa hat with the base and tassel also present. Two colors are available for this template: red and green. Vintage or retro designs are always popular options to use. The more you go back in time, the better designs they have. 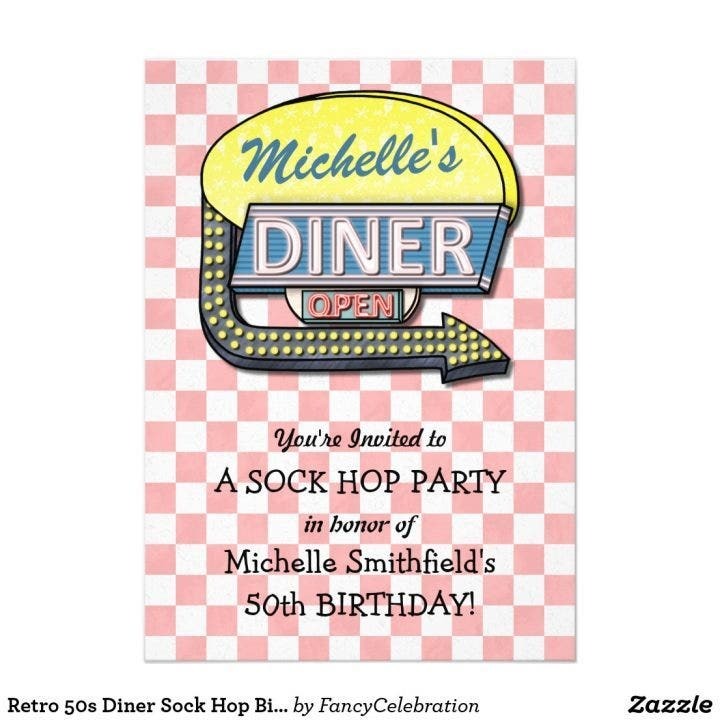 The 1950s, for example, saw some wonderful post-war themes that are still used today, one of which is the ’50s diner concept. The signboards used in most diners as seen in this template usually have some bright neon colors and large bold text. The diner signboard is complemented by a checkered red background. Food famously served in diners include hamburgers, fried chicken, hotdog sandwiches, ice cream, shakes, and pancakes. So if you serve these tasty dishes, then purchasing this template is highly recommended. This is another sample invitation template that you can use for your grilled restaurant. Customers will certainly flock to your restaurant if you are planning to serve up some discounted grilled food or even a grilled buffet. Use this invitation for your next restaurant promotion. 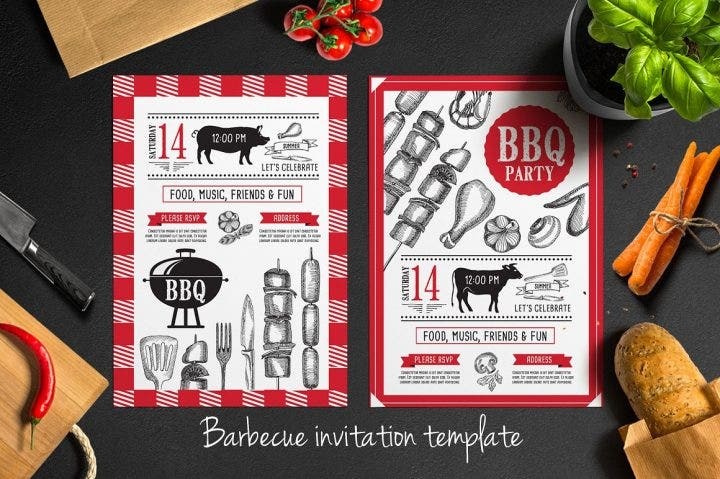 Similar to the other barbecue formal invitation template, this template uses images relating to barbecues such as grilling tools and equipment. 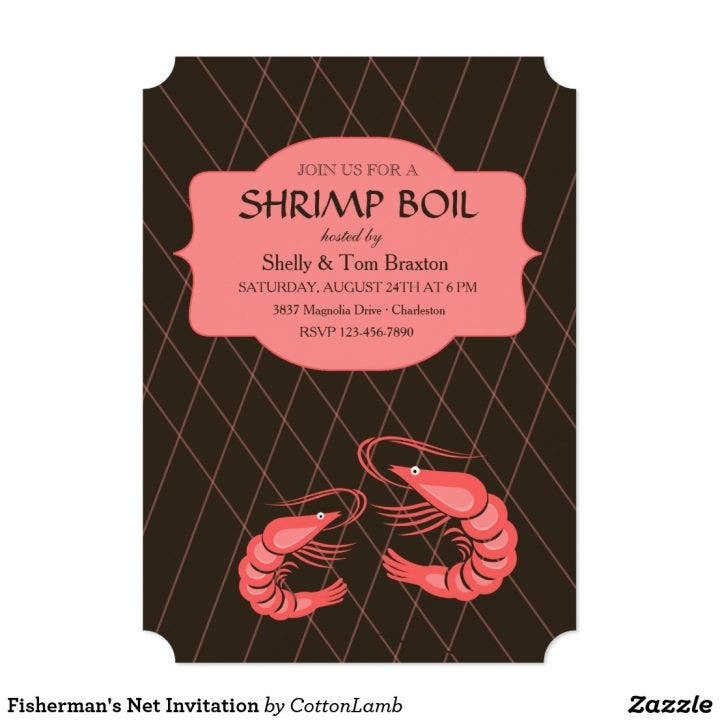 This fisherman’s net invitation is the perfect restaurant dinner party invitation template for seafood restaurants. Seafood buffets are very popular, so invite your customers for an appetizing seafood buffet in your restaurant. Grilled fish, baked oysters, fried shrimps, sauteed crab meat, clam soup, and seafood pasta will certainly make your customers think twice about declining your invitation. This template uses a red-and-black color combination and a net design in the background. An image of two shrimps is also incorporated in the template for added aesthetics. This cute and attractive donut kid’s birthday invitation template is one you should consider for your pastry restaurant. The aroma and flavors of these sweet treats are more than enough to make you take a side trip to the nearest donut shop. This donut birthday invitation design template uses some pink hues for the text and also for the cartoon donut image which has some multi-colored sprinkles. It is a given fact that people are at their happiest when they eat and drink. 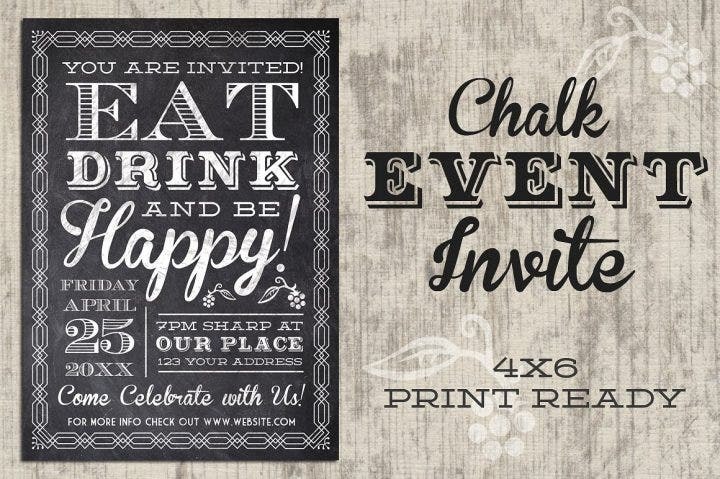 This is what this “eat, drink, and be happy” chalkboard invitation represents. The chalkboard design adds to the aesthetic of this template. Chalkboard designs have been popular these days and have been used in practically any design for any event. Market your hotel or restaurant by using it as a venue for weddings and other social events. 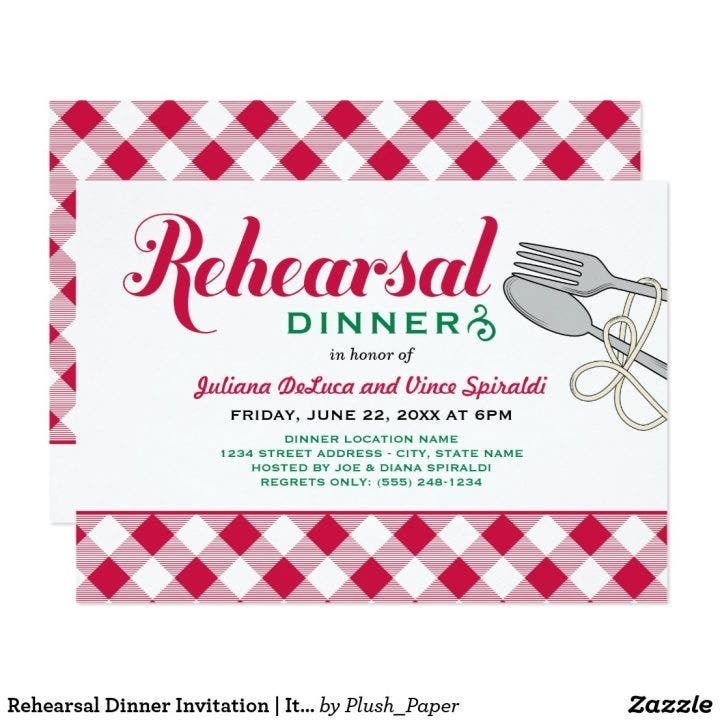 This rehearsal dinner invitation is perfect for social activities and other events. This invitation template is not only meant for Italian restaurants so you can use this for your own restaurant as well. This template has a red-and-white striped tablecloth background and uses some red-and-green color combinations for the text. Sushi is a simple dish and is the favorite comfort food from the country it originated from, Japan. Despite its simplicity, it packs very powerful flavors which can make you eat a whole platter of it. Sushi is not only limited to fresh fish topped on rice or rice wrapped with seaweed, it can contain other flavors or fillings as well, especially Western-style sushi (California maki, Philadelphia roll, sushi truffle ball, etc.). If you are a restaurant serving some delicious handmade fresh sushi and planning to host a sushi birthday celebration in your restaurant, then this sushi birthday invitation template is for you. This template contains numerous variations with the text written at the center of the template. A word of caution, though; you may not serve some of the sushi as seen in this template so edit the template accordingly. 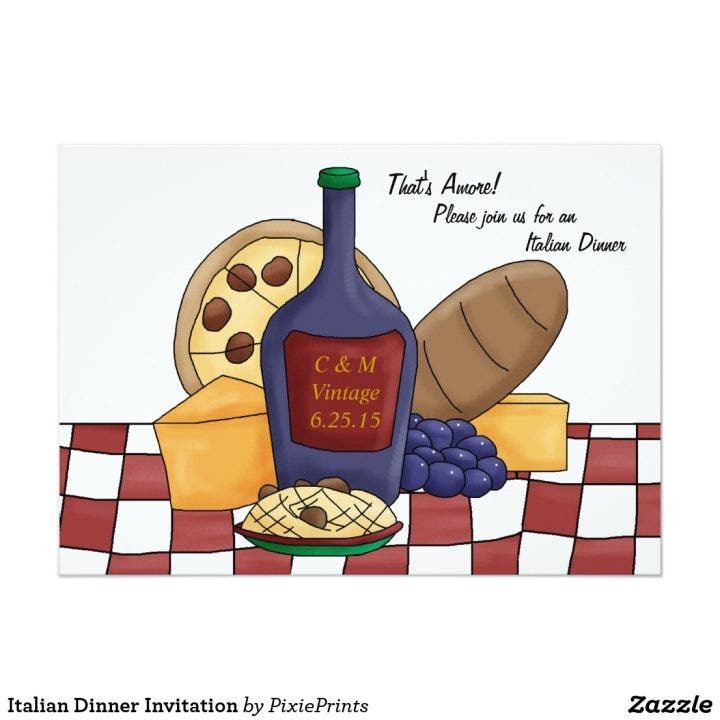 This Italian printable dinner invitation template uses colorful cartoon art in its contents including the spaghetti, bread, wine, cheese, pizza, and tablecloth. This template is a great background to use for your restaurant especially if you are serving the above-mentioned food and drinks. The font style in this template uses some nice calligraphy which is the perfect match for formal restaurants. Mexican-inspired dishes are some of the best-tasting dishes around the world. Similar to Indian dishes, Mexican cuisine has a distinct spicy flavor in its dishes. Tacos, burritos, quesadillas, and salsa are some Mexican favorites which are sold in every corner of the globe. This Mexican fiesta card uses festival (which translates to “fiesta” in Spanish) themes like buntings and a sombrero in a cartoon style. This card template is a better fit for a kid’s birthday celebration and can be used for restaurant events as well. Is your restaurant serving some delicious Chinese food like dumplings, sweet and sour fish or pork, wonton soup, gong bao chicken, chow mein, and roasted Peking duck? 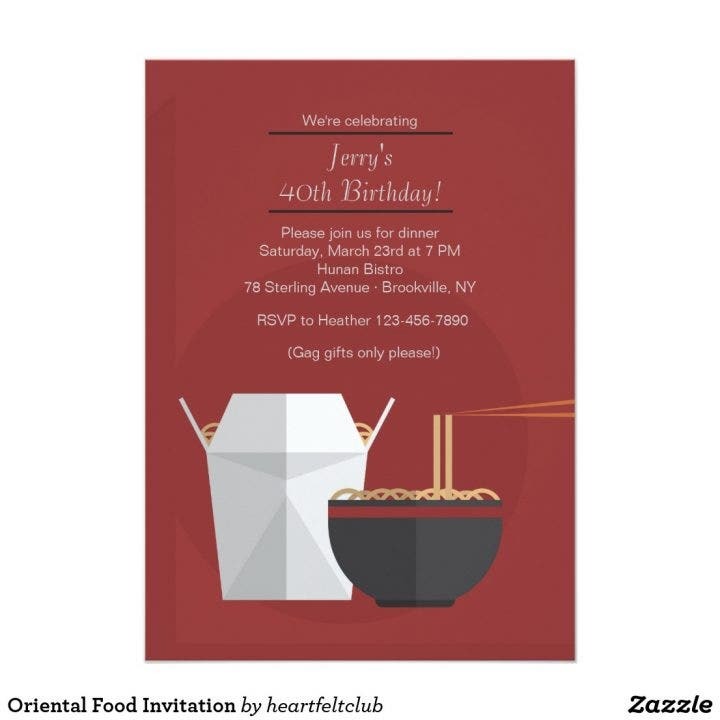 Then this Chinese food invitation is the best template to use for your restaurant. This template uses some Chinese takeout box and noodle 2D images complemented with white text and a dark red background. This is one of the best invitation examples to use for a pasty or dessert restaurant. This template contains emoji of various desserts like a donut, lollipop, ice cream, cupcake, watermelon, pineapple, candy, and a cake with some designs of buntings and gold glitter in the border and background. The gold glitter in the background complements the colorful cartoon dessert emoji. Edit this template with your own restaurant invitation. If you are serving some mouthwatering pizza and other Italian food, then use this pizza party invitation. Pizza is very popular with adults and kids alike due to its flavors. Who doesn’t love an oven-baked dough topped with cheese, tomato sauce, and a little bit of ham or pepperoni? Pizza is one of the easiest types of foods to sell to customers, so take advantage of this template and start selling some delicious pizza. This template contains an image of a whole pizza topped with olives, pepperoni, bell peppers, mushrooms, cheese, sauce, and tomatoes. The birthday details are listed on the left side of the template. Use this pizza party template if you are hosting a pizza party in your restaurant. So there you go—some of the most attractive as well as mouth-watering restaurant invitation templates you can use for your establishment. Host a buffet, sports or movie viewing party, and other social events and invite customers using the restaurant dinner invitation designs above. Watch your customers arrive in drives.